The Innovative University illustrates how higher education can respond to the forces of disruptive innovation , and offers a nuanced and hopeful analysis of where the traditional university and its traditions have come from and how it needs to change for the future. 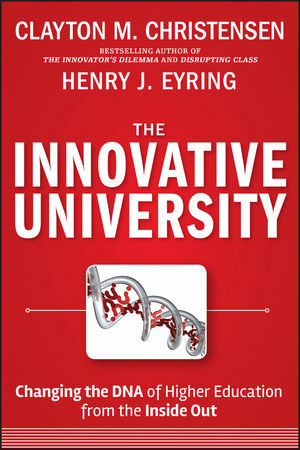 Through an examination of Harvard and BYU-Idaho as well as other stories of innovation in higher education, Clayton Christensen and Henry Eyring decipher how universities can find innovative, less costly ways of performing their uniquely valuable functions. This book uncovers how the traditional university survives by breaking with tradition, but thrives by building on what it's done best. CLAYTON M. CHRISTENSEN is the Robert and Jane Cizik Professor of Business Administration at the Harvard Business School and the founder of Innosight Institute, a nonprofit think tank. He is the author of many books, including The Innovator's Dilemma, and has applied his theory to K12 education in Disrupting Class and to medicine in The Innovator's Prescription. HENRY J. EYRING serves as an administrator at Brigham Young University-Idaho. He is a former strategy consultant at Cambridge, Massachusetts-based Monitor Company.